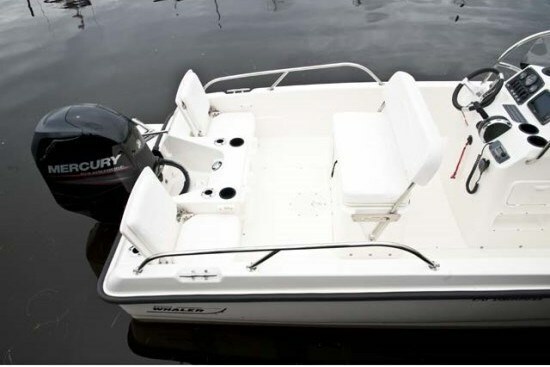 The 170 Dauntless® is truly meant to be a versatile boat and is built with Boston Whaler’s proprietary Unibond construction process which bonds the inner hull with the deck to produce a strong unitized assembly. The real beauty of the 170 Dauntless® is that you can purchase it with just the bare essentials for boating or you can option it up to suit your particular boating requirements, be that fishing, cruising, or watersports recreation, or perhaps a combination of all three. Let’s first look at the base boat. 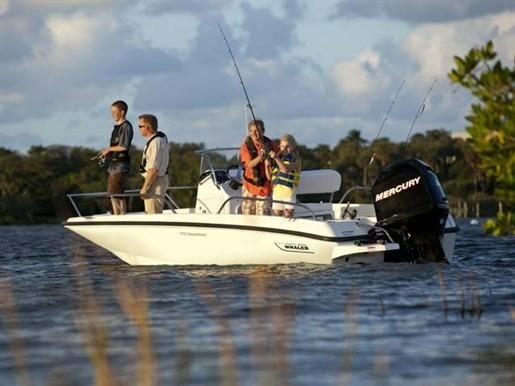 Rigged with the standard Mercury 90 ELPT EFI Four-Stroke outboard motor, Boston Whaler performance reports show the most efficient cruising speed to be 26.5 miles per hour at 4000 RPM while producing 6.71 miles per gallon (US) giving a range on the built-in 35 (US) gallon (132L) fuel tank of 211 miles. At wide open throttle 5960 RPM, top speed is a respectable 42.9 mph while fuel economy drops to 4.54 mpg and range to 143 miles (although who would ever run 143 miles at full throttle anyway!) The point is though, that this top speed is more than sufficient to compensate for lots more passengers (rated for a maximum of seven) or for your choice of watersports activities. 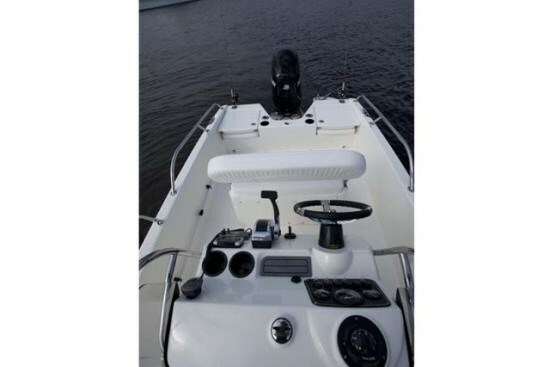 Seating for two is provided at the center console helm with an adjustable backrest that allows for forward or rear-facing seating or standing and leaning back at the helm. Two aft cushioned jump seats are also provided – one on each side of the motor well. Storage is available under all of these seats. Immediately in front of the console is a 54-quart cooler with a cushioned top for seating for perhaps two cozy persons. For more seating capacity, opt for the bow cushion which covers the raised bow deck storage compartment. If you want to go all out, choose the optional bow sun lounge with backrest cushions, but you will need to give up the aforementioned cooler seat to accommodate this option. A lockable storage compartment is provided in the console itself. An additional 54-quart slide-out carry-on cooler is optionally available for under the helm seat. The molded helm console comes complete with an acrylic windscreen, itself surrounded with a wraparound stainless steel grabrail. 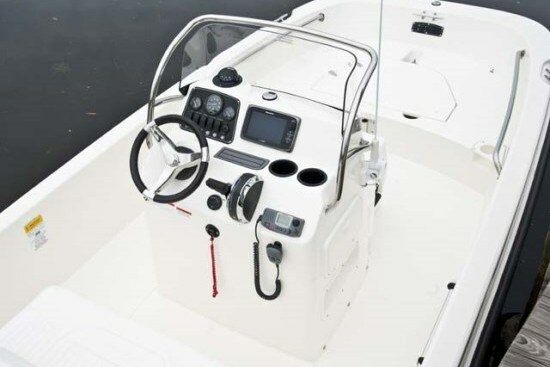 Analog outboard gauges are provided on the console with an electrical switch panel with circuit breaker protection and Mercury® binnacle motor control. There are two drink holders, two rod holders, a compass and a blank flat surface for mounting of additional electronics such as a GPS screen, fishfinder, etc. Tackle storage drawers are optionally available for the built-in storage compartment. A swing-tongue, galvanized, torsion axle trailer is standard with the 170 Dauntless® but you can delete this if you wish, or you can further upgrade it to add disc brakes and/or radial tires. If cruising is your thing, add the neat cockpit table which conveniently mounts on the forward surface of the motor well. You may also want forward grab rails to replace the standard bow rail or even a split bow rail if getting on and off the boat at the bow is convenient for you. Also go for the Fusion® AM/FM stereo with MP3/USB input and two speakers. The optional ski pylon would be a great accessory for any watersports and it augments the standard single port side swim platform with boarding ladder. Any fishing aficionados have lots of additional choices to feed their passion. Have a blue interior livewell installed under the helm seat, add the raw water washdown, and perhaps the pedestal fishing seat at the bow. 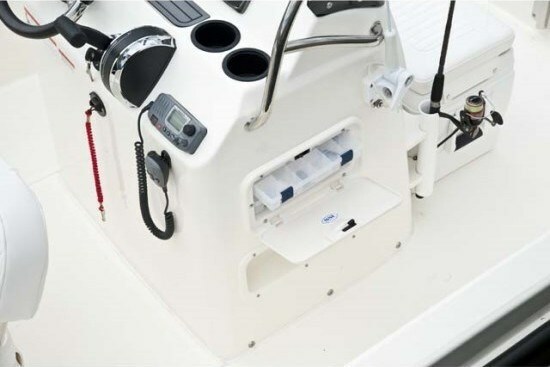 A bow trolling motor panel with its own battery box is available and you can add more transom rod holders to augment the four already provided at the transom. 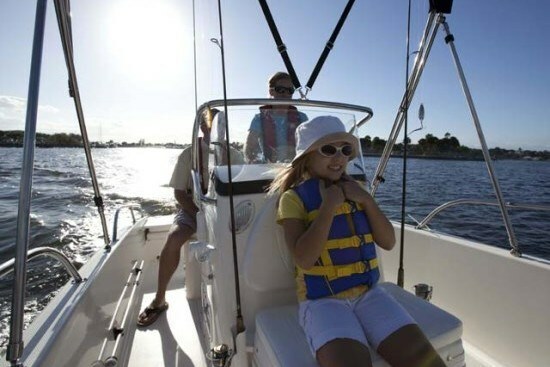 Regardless of your boating lifestyle, you may want to add some canvas covers including a sun-top with boot, and Raymarine® electronics including the E7D with GPS, plotter, and fishfinder, and perhaps the Ray49 VHF radio. Yes, the 170 Dauntless® is truly a versatile boat.